Le Batard and the shipping container discuss Chris putting raisins in his picadillo and Dwyane Wade's final home game. On today's show, can Adam Schefter pee while holding three cell phones? Le Batard, Stugotz and Stan Van Gundy are joined by NBA Hall of Famer, Gary Payton and Brandone Francis from the Texas Tech basketball team. Stan Van Gundy gives us his NBA nuggets and Marty Smith tells one of the worst stories ever told on the show. Le Batard, Stugotz and Stan Van Gundy debate what five movies they'd bring if they were stranded on an island and we take more calls on celebrity bathroom encounters. Le Batard and the shipping container discuss the emotions going into Dwyane Wade's final games and David Samson joins the show. On today's show, do you miss the flabby 7 footer in the NBA? Le Batard and Stugotz are joined in studio by Michael Smith. We discuss Game of Thrones and the Golden State Warriors. Le Batard and Stugotz discuss Russell Wilson wanting a new contract and Allyson tells the story of when Stugotz fired her. Le Batard and the shipping container discuss the Miami Heat and Miami Marlins. Also, Mike is excited about UM spring practices. On today's show, do you think of Bill Belichick as hefty? We're joined by Ron Magill and Greg Cote hosts the final segment of the show. Le Batard, Stugotz and Greg Cote discuss the Cleveland Browns upcoming season and Greg has his Back In My Day. Le Batard, Stugotz and Greg Cote discuss Stugotz's appearance on Around the Horn and Jay Bilas joins the show. It's a wheel of topics kind of Tuesday! We discuss the Miami Heat, Quentin Tarantino movies and Randy Scott has a Hack In My Day. On today's show, did Jason Witten lie to us? Le Batard and Stugotz discuss Odell Beckham Jr. showing up to Browns offseason workouts and Stugotz has his Weekend Observations. Le Batard and Stugotz discuss Greg Schiano stepping down as Patriots defensive coordinator and we have Funniest Thing From The Sports Weekend. 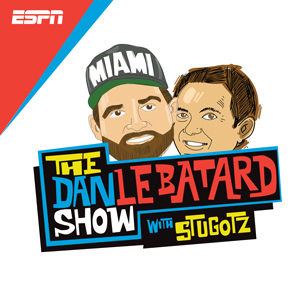 Le Batard and Stugotz discuss Duke losing to Michigan State and Tony Reali joins the show to discuss Stugotz potentially being on Around the Horn. Stugotz and the shipping container discuss Mike wanting to get a tattoo and Stugotz appearing on Around The Horn. On today's show, will you eat a sandwich in the bathroom? Le Batard and Stugotz are joined in studio by Hank Azaria. He shares an interesting fact about The Simpsons and we open up the club! Le Batard and Stugotz are joined in studio by Hank Azaria and Tim Kurkjian joins the show. Le Batard, Stugotz and Hank Azaria discuss the proper way to eat a pineapple and Hank does a bunch of his impressions. Amin Elhassan and the shipping container discuss Miami Marlins Opening Day and the Miami Heat beating the Dallas Mavericks. Also, can you microwave Styrofoam? On today's show, do the Utah Jazz have the credentials to hit you with a, "not on our watch"? Le Batard, Stugotz and Amin Elhassan discuss Devin Booker's recent dominance and Action Bronson joins the show. Le Batard, Stugotz and Amin Elhassan discuss the Jordan Bell story and Amin challenges Chris to a karaoke-off. Le Batard and Stugotz discuss Jordan Bell getting in trouble with the Warriors and we're joined by Bear Grylls. Le Batard and the shipping container are fired up about Opening Day! Chris and Billy go to Marlins Park to interview Lewis Brinson and David Samson joins the show. On today's show, do you know why Joe Jackson was shoeless? Le Batard and Stugotz discuss potential rule changes to basketball and we see who can make the best swish sound. Le Batard and Stugotz discuss the toughest baseball players ever. Who wins a fight in their prime, Kyle Farnsworth or Nolan Ryan? Le Batard, Stugotz and Amin Elhassan discuss Stugotz's fantasy baseball team and how he is incapable of being honest. Le Batard, Stugotz and the shipping container discuss Billy's fantasy baseball team and Chris Bosh's jersey getting retired. Sarah talks with Greg Cote about the series of mishaps that have led to his second wave of fame, why he should not have become friends with Dan Le Batard, the time he unwittingly wrote a story that was completely false, his favorite "Back in My Day"�, and his infamous cough. On today's show, is there anything in life better than a good, hard, crisp piece of French bread dipped in olive oil? We're joined by Zoo Miami's Ron Magill and Greg Cote has his Back In My Day. Le Batard, Stugotz and Greg Cote are joined by Brian Windhorst and NBA Hall of Famer, Bob McAdoo. Le Batard, Stugotz and Greg Cote discuss a turkey vulture crashing through the window of Stephen A. Smith's office. We're joined by Trey Wingo who is on the scene. Le Batard, Greg Cote and the shipping container celebrate Chris Bosh's career with the Miami Heat. The whole show is sad over Gronk's retirement. Stugotz also gave us his Weekend Observations and Stan shared his NBA Nuggets. Stan Van Gundy shared his NBA Nuggets, the guys discussed the funniest thing from the weekend and Stugotz updated the polls. Stugotz shared his Weekend Observations, the guys discussed Robert Kraft's apology and we updated our March Sadness tournament. Stan Van Gundy joined Dan and Stugotz to honor Gronk, discuss Tom Izzo and break down UCF vs. Duke. The Shipping Container plays a round of "What's Good?" Amin and Stan Van Gundy also joined the show to discuss basketball. On today's show, is LeBron James a compiler? Stugotz makes fun of Chris for planning a vacation Masters weekend and we open up the club! Stugotz and Greg Cote are joined by Tim Kurkjian and we update our March Sadness tournament. It is Wake and Take on a Friday! Stugotz and Greg Cote discuss the NCAA tournament and we try to find valuable Cheetos. Le Batard, Greg Cote and the shipping container discuss Spring Break on South Beach and Inter Miami playing in Fort Lauderdale. On today's show, who's Rick Pitino rooting for, his son or the school he's suing? Stugotz and Izzy Gutierrez come up with a good way to avoid tanking in the NBA and Billy discusses the music that will play at his wedding. Stugotz and Izzy Gutierrez inexplicably start the show talking about tennis and Daniel Baldwin joins the show. Stugotz, Izzy Gutierrez and the shipping container discuss the Heat beating the Spurs last night and Chris goes through his show notes. On today's show, do you throw the yellow Starburst off to the side? Le Batard, Stugotz and Stan Van Gundy discuss corruption in college sports and we update our March Sadness tournament. Le Batard, Stugotz and Stan Van Gundy are joined in studio by Mardy Fish and we discuss Zion Williamson's future in the NBA. Le Batard and the shipping container talk airplane etiquette with Stan Van Gundy and we're joined by David Samson. Le Batard, Stugotz and Greg Cote discuss everything going on with the New York Giants and Chris makes one of the best/worst jokes ever told on the show. Le Batard, Stugotz and Greg Cote discuss Mike Trout signing the biggest contract in sports history and Marty Smith joins us to make a big announcement. Le Batard, Stugotz and Greg Cote discuss Mike Trout signing an extension with the Anaheim Angels. Jeff Passan joins us to discuss. Greg Cote and the shipping container discuss the Dolphins moving on from Ryan Tannehill and Greg says he's thinking about getting a tattoo. On today's show, if Gardner-Webb had Zion Williamson would they be a Final Four favorite? Le Batard and Stugotz are joined in studio by former NBA player, John Amaechi. We play one of our favorite games, Stump The Maech. Stugotz has his Weekend Observations and we discuss everything that has happened with the Pittsburgh Steelers. Stugotz proves he can fake his way through the college basketball tournament and we unveil our March Sadness tournament. Izzy Gutierrez and the shipping container discuss Ryan Tannehill's tenure with the Miami Dolphins and the Miami Heat season coming to an end. On today's show, can Warren Buffett make you disappear? Stugotz, Izzy Gutierrez and the shipping container discuss the Syracuse player tripping Zion Williamson and we open up the club! Stugotz, Izzy Gutierrez and the shipping container discuss Odell Beckham Jr. signing with the Cleveland Browns and Zion Williamson's dominance. It is Wake and Take on a Friday! We discuss Zion Williamson's future at Duke and whether Tiger Woods will win a major this year. Izzy Gutierrez and the shipping container discuss some of life's simple pleasures and what's going on with all the construction in Miami. On today's show, is John Mayer a dish? Stugotz and Greg Cote are joined by Mike Greenberg and we imagine what literal coaching trees would look like. Stugotz and Greg Cote discuss Zion Williamson's future with Duke basketball and Stugotz's budding friendship with George R. R. Martin. Stugotz and Greg Cote discuss the Golden State Warriors recent struggles and whether or not we should feel good for Browns fans. Greg Cote and the shipping container discuss the Miami Dolphins game plan for next season and Chris says crawfish is overrated. On today's show, who is going to be more annoying today, Mike Ryan or Stugotz? Le Batard, Stugotz and Stan Van Gundy debate how good the Browns will be this season and we're joined in studio by former NFL player and current magician, Jon Dorenbos. Le Batard, Stugotz and Stan Van Gundy are joined by Stugotz's wife, Abby, and the director of the Richard Pryor documentary, Jesse James Miller. Le Batard, Stugotz and Stan Van Gundy discuss the latest NFL free agency news. Mike and Stugotz are obnoxiously excited about who their teams signed. Le Batard, Stan Van Gundy and the shipping container discuss Odell Beckham Jr. signing with the Browns and the Miami Heat potentially making the playoffs. On today's show, is Bill Belichick going to turn Blake Bortles into Joe Montana. Le Batard, Stugotz and Greg Cote are joined by Zoo Miami's Ron Magill and XFL commissioner, Oliver Luck. Greg Cote has his Back In My Day and we marvel at the absurdity of the latest college sports scandal involving Aunt Becky from Full House. Le Batard, Stugotz and Greg Cote discuss NFL free agency and Steve Kerr's comments about Draymond Green. Le Batard, Greg Cote and the shipping container discuss the Miami Dolphins, Billy going to Marlins Spring Training, and Greg's career as a college soccer goalie. Sarah talks with Dan Le Batard about his childhood in Miami, his reluctant climb in sports media, the moment he lost interest in writing about sports, the pressure of conducting the sloppy orchestra that is his radio show, his relationship with Stugotz, whether or not he's concerned about burning out, and the time he pooped in a parking lot. On today's show, are bats capable of being cute? Le Batard and Stugotz are joined in studio by Sarah Spain and we have Funniest Thing From The Sports Weekend. Stugotz has his Weekend Observations and we're joined by Bill Barnwell. Le Batard and Stugotz discuss Antonio Brown getting traded to the Raiders and we play sound of Jeff Van Gundy saying the Lakers should consider trading LeBron James. Le Batard and the shipping container discuss the Miami Heat, baked potatoes and we do a Life Hack Attack. On today's show, what kind of person are you, close your eyes and feel something or open your eyes and dance? Le Batard and the shipping container are joined by Gary Sinise and we open up the club. Le Batard, Greg Cote and the shipping container discuss Ronda Rousey potentially leaving the WWE and Wright Thompson joins the show. Le Batard, Greg Cote and the shipping container discuss the Michael Jackson documentary, Leaving Neverland, and Antonio Brown potentially getting traded. Le Batard, Greg Cote and the shipping container discuss the Miami Dolphins and we debate whether it's ok to look up a set list before attending a concert. On today's show, are you surprised Stan Van Gundy isn't a sweatpants guy? Le Batard, Stugotz and Stan Van Gundy discuss the Golden State Warriors recent struggles and Vincent D'Onofrio joins the show. Le Batard, Stugotz and Stan Van Gundy share funny stories from when they were umpires and Stan gives us his NBA nuggets. Le Batard and Stan Van Gundy discuss whether people at ESPN like our show and we have a surprise for Dan. Le Batard and the shipping container discuss what it's like working in South Beach and we're joined by former Miami Hurricane, Joaquin Gonzalez. Le Batard and Izzy Gutierrez debate whether the Golden State Warriors are vulnerable after their recent struggles and we throw tomatoes at Chris Cote's face. Le Batard and Izzy Gutierrez discuss the Michael Jackson documentary, Leaving Neverland, and Kevin Arnovitz joins the show. Le Batard, Izzy and the shipping container discover Bob Costas' middle name and realize that we need to come up with a middle name for Izzy. Le Batard, Izzy Gutierrez and the shipping container discuss the Miami Marlins and bread. Also, David Samson joins the show. On today's show, do you still consider Pluto a planet? Le Batard and Greg Cote are joined by Ron Magill and John Turturro. Greg Cote has his Back In My Day and we're joined by Derek Murphy, a marathon investigator. Le Batard and Greg Cote discuss a minor league baseball team wanting to have Greg Cote Day and Antonio Brown getting paid to send messages to fans. Le Batard, Greg Cote and the shipping container discuss the cruise Greg was on this past weekend and the Miami Heat barely beating the Atlanta Hawks. On today's show, do you do sing-alongs in the car? Le Batard and Amin Elhassan are joined by Tom Haberstroh and we discuss Guillermo's bathroom habits. We have Funniest Thing From The Sports Weekend and Amin Elhassan is in full Stugotz mode today. Le Batard and Amin Elhassan discuss the Lakers potentially not making the playoffs and we play interesting sound from the Sloan Analytics conference. Le Batard, Amin Elhassan and the shipping container discuss the Michael Jackson documentary, Leaving Neverland, and the most unnecessary hall of fames. Chris Bosh tells us how tall he is, fake Stugotz has a Sports Whisperer and we open up the club! Le Batard and Stan Van Gundy are joined by Brian Kenny and Stan gives us his NBA nuggets. Le Batard, Stan Van Gundy and the shipping container discuss Bryce Harper signing with the Phillies and we celebrate Stugotz's incompetence. Le Batard and the shipping container debate where Dwyane Wade ranks all time and we play one of our favorite games, What's Good?! On today's show, when Stugotz uses "in fact", is it ever a fact? Le Batard and Stugotz discuss everything going on with the Boston Celtics and we clear the computer of all the Jim Zorn sounds we have. Le Batard and Stugotz are joined by Bill Simmons and we recap the season finale of The Masked Singer. Le Batard, Stugotz and the shipping container debate what kind of French fries are the best and Tim Kurkjian joins the show. Le Batard and the shipping container discuss Dwyane Wade's game winner against the Golden State Warriors and David Samson joins the show. On today's show, would you chase goats or run from goats? Le Batard and Stugotz are joined by Ron Magill and we find out who the best NBA small forwards were in the 1980's. Le Batard and Stugotz discuss Dan running errands with Amin Elhassan and Stugotz gets sent to the therapy couch.